Are you looking for a simple yet effective Skin Care Routine? Here at Cosmetic Injectables we have designed a simple yet very effective skin care routine and want to share it with you. You can see the results for yourself when you meet Elizabeth as her skin is a testament to the routine we have developed. When you find out how old Elizabeth is you will want to find out more! Endocare CELLPRO™ contains the very latest advancements in Endocare Snail Biotechnology, targeting the signs and causes of skin ageing by working deep within the skin, and also at the skin’s surface. It almost sounds too good to be true – but with lots of clinical data and scientific research behind it, you can be confident of the results! Talk to Elizabeth to find out exactly how Endocare CELLPRO works. The Aestheticare Gentle Daily Cleanser – A gentle oil-free daily cleanser suitable for all skin types, with added moisturisers and anti-oxidants. Aestheticare Gentle Daily Cleanser creates a rich lather to remove surface dirt and impurities and leave skin feeling clean, fresh and wonderfully hydrated.Perfect for daily use morning and night on all skin types. 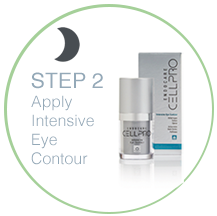 The intensive eye contour can be used on a morning and/or evening. Apply a small amount around the eyes and pat in gently. This light, hydrating cream is designed to target around the ageing eye area, helps with puffiness and increases circulation. Anti-Wrinkle Cream, non-oily yet creamy and rich advanced moisturising system, this is perfect as a night cream before bed. You can also use on the neck and décolletage. With similar properties and ingredients to the Gelcream, it makes this trio a great skin maintenance set. Skin will be hydrated, smoother, more vibrant and lines and wrinkles will be far less noticeable. A gentle, oil-free daily cleanser suitable for all skin types with added moisturisers panthenol and allantoin, and anti-oxidant lutein, to help protect, soothe and soften the skin. The Gentle Daily Cleanser creates a rich lather to remove surface impurities and leave your skin feeling clean and wonderfully hydrated. Perfect for daily use morning and night on all skin types. 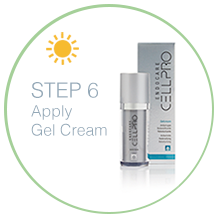 Anti-Wrinkle Gelcream, a light and creamy gel that leaves your skin feeling hydrated but dry to the touch. Perfect for morning as the great formula sits really nicely under makeup. The gel is very light but don’t be fooled as it’s packed with Vitamin C, E, and A, anti-oxidant protection, CAF Bio Action Technology, stem cell activators and hyaluronic acid, which all help to keep the skin hydrated, protected and diminish the appearance of line and wrinkles. 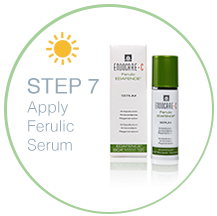 Apply to cleansed skin every morning, a light, oil-free daily use defence serum that melts quickly into the skin. This super serum provides your skin with that all important daily pollution protection, plus also much more. 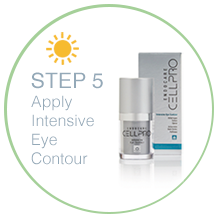 When using Endocare CELLPRO products you must also use Heliocare® every morning as the last product you apply before make-up. 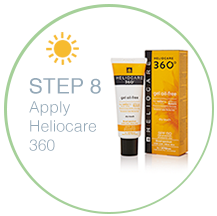 Heliocare provides essential UV and anti-oxidant protection – it’s particularly important when you’re using a product that contains Vitamin A ingredients, such as Endocare CELLPRO. There’s a Heliocare to suit everyone, whether you’re looking for light foundation coverage, a mineral product or a rapidly absorbed hydrating product. 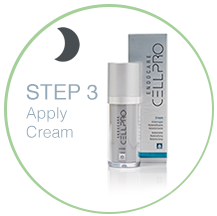 CELLPRO is the only skincare product in the world that’s clinically proven to activate your stem cells the source of naturally beautiful skin. Activating stem cells, stimulates the generation of new skin cells, collagen, elastin and hyaluronic acid to restore your skin’s natural radiance, and reveal firmer, tighter skin with fewer lines and wrinkles. A ingredients which increases skin cell renewal to reveal smoother and brighter skin. Add to that fabulous ingredients that plump and improve the underlying architecture of the skin, an advanced moisturising system and an anti-ageing complex of Vitamins C and E, and you’ve got a beautiful blend of clinically proven anti-ageing ingredients!